This is a new one on me! I was googling around and through some odd combination of search terms, I can across the website of someone named Karen who makes many different forms of prayer beads, including ( drum roll please . . . .) a “motel rosary.” According to her website, Karen was driving in the mountains when she saw a sign for a motel called “Fawn Hollow.” She thought it an evocative name, one that called up a peaceful and soothing image in her mind. Soon she went to a phone book and made a list of motel names that were equally as evocative – Misty Mountain, Peaceful Valley and Silver Moon among them. Now she recites all their names on her Anglican rosary! How creative is that? Yeah, Karen! Rosary prayers from a phone book! I love it. Take a buzz around Karen’s site. 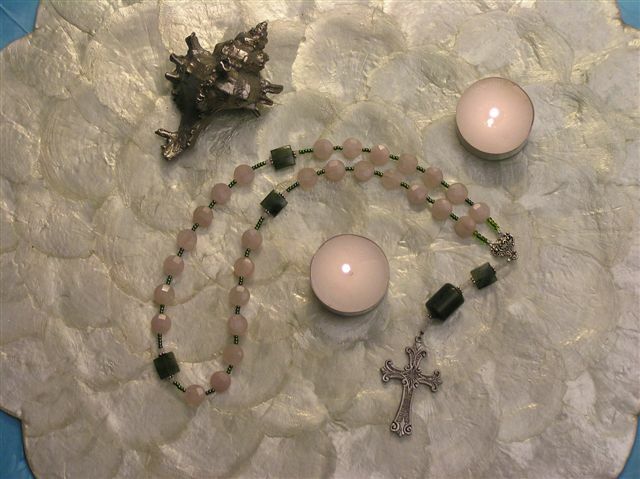 She has many wonderful suggestions for different sets of prayer beads as well as many lovely pictures. She also gives some basic instructions for making prayer beads. Some of the prayer beads she shows I am unfamiliar with, including Unitarian-Universalist beads, moon beads and a universal rosary. So cool!! !